So, the 2016 Cru Ski Trip was planned to go a little more upmarket (on the transport…will come back to the accommodation later) and so we met at the Ueno Shinkansen gates…with the exception of Yusei’s girlfriend (or was she not his gf…more on this later) who had been pulling an all night shift at her bar (Nishi-Azabu Rugby Club- get down there for some live rugby). Yusei did the gentlemanly thing (with a little nudge from Tooley) of waiting for her and getting the next Shink up to Nagano. The Cru travelled up in good spirits and gave themselves a proverbial pat on the back for choosing the shink with its leg space, peace and quiet and convenience (not rubbing in it to the Fukui van boys or anything…) and were really looking forward to linking up with the boys who had travelled up from Fukui the evening before. Special thanks to Seth for renting a van and ferrying people over to Hakuba and within the resort. After a bus transit the Cru were assembled at the bottom of the Goryu pistes ready to hit the slopes. Day 1 on the slopes passed without notable incident; a white-out near the peak of the mountain created seriously hazardous conditions (we couldn’t even see Tooley’s jacket) and Yusei’s chances of cementing Shiori as a girlfriend took a double blow as they arrived a couple of hours late (after missing the bus transit) and on his first run, Yusei’s fittings came loose and in the ensuing melee Shiori lost touch with the group. Things did improve slightly for Yusei as he managed to undo the stiff buckles on this writer’s ski boots…he claimed it was “the best thing to happen to him” that day. So we retreated to the accommodation for some ‘R&R’. After being unable to book the lodge from the previous year we’d bagged this particular lodge through a recommendation of Cocksy’s mate. After checking in, Cocksy and Laura found their room was a bed…with precious little space to manoeuvre around its fringes…Laura would later wake to find that this ‘manoeuvre’ could be performed by a trapeze artist but not 6ft 3 Cocksy who had been hitting the beers for a number of hours. In another room, Neil seemed astonished to find out that there were towels aplenty for other rooms…except his. The evening’s activities consisted of an onsen and some food and drink at the local bar and although Kaori nearly fainted at the onsen the Cru enjoyed a nice evening winding down with with the tried and tested beers and fried chicken combo. 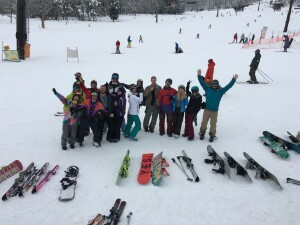 The conditions were fantastic; Yusei’s skiing (and chances with Shiori?…) dramatically improved, Neil “two fingers to the snow plough” Howard took a few tumbles and Incha was involved in a “hit & run” collision but we all arrived safely back in Tokyo later in the evening. A huge thank you to Tooley for organizing another excellent ski trip. The ski trip is fast becoming an integral fixture on the Cru calendar and we all look forward to next year!